I don’t normally eat popcorn. I like to avoid corn products usually. But tonight we had an Open House here at Club Fritch and popcorn is a rather inexpensive and (other than not having a chip-like snack food at all) a relatively healthy alternative to other snack foods. And we have an air-popper. But I didn’t want to serve bland, plain popcorn, or even just buttered and salted popcorn. So I got out the air-popper and the corn and opened my kitchen shelves to see what fancy things could season my popcorn. A while back Amy Mac had given me a shaker of fine-ground salt. So I started with that. 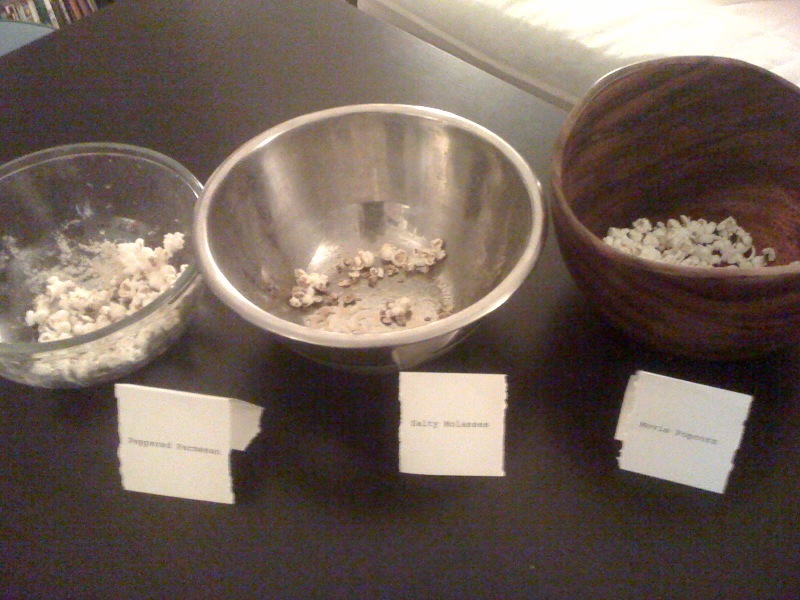 Butter and salt is a mainstay; so I made that and called it Movie Popcorn. Then I remembered that I’d added parmesan to popcorn before and it’d been yummy; so I pulled out the parmesan. But I didn’t want just the cheese flavour. So I pulled from my favourite potato chip flavour and added black pepper. I seasoned that one with a little salt and mixed in some melted butter. It was cheesy and spicy and I called it Peppered Parmesan. And I’ve recently fallen in love with a salty-sweet chocolate covered almond snack at Trader Joe’s, and people love kettle corn, so I wondered what I could make that was salty and sweet. I knew that when we’ve made our own granola we’ve mixed molasses with maple syrup to get a lovely sweet drizzle that covers most everything. So I mixed a little molasses (1/4 cup?) and a little Grade B maple syrup (1/4 cup?) in a saucepan and melted it together. I drizzled that over the freshly popped popcorn and added the finely ground sea salt and ta da! I had a salty and sweet snack that I called Salty Molasses. Looks like the Salty Molasses was the favourite! Recipes for Peppered Parmesan and Salty Molasses are after the jump. Drizzle melted butter over fresh air-popped popcorn. Immediately shake pepper and parmesan over popcorn. Mix together. Enjoy. Melt molasses and maple syrup together in small saucepan. Stir together. Drizzle syrup mixture over fresh air-popped popcorn. Immediately shake sea salt over popcorn. Mix together. Enjoy.